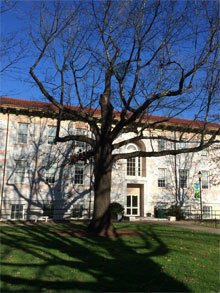 The Black Oak in front of the Callaway Building on the Quad will be removed Dec. 22 due to extensive decay. A replacement tree will be planted before the start of next semester. After many decades of providing cooling shade for thousands of Emory students, faculty, staff and Commencement guests, the Black Oak (Quercus velutina) located in front of the Callaway Building on the Emory University Quadrangle must be removed due to extensive decay in the upper trunk. Tree removal is scheduled for Dec. 22 so as not to disrupt classes. "While it is sad to see a specimen tree like this Black Oak removed, especially when it has been such a fixture on the Quad for all of these years, the tree is clearly in serious decline. We welcome the fact that it will be replaced by another tree in about the same place," agree Chris Beck and John Wegner, both members of the Committee on the Environment. Based on aerial photos of the Quad, it is believed the tree was planted in the late 1940s. The tree was scheduled to be removed over a decade ago when it was suffering massive dieback due to the effects of compacted soil on the health of the root zone. At that time, Facilities Management personnel decided to try newly developed techniques to alleviate soil compaction in an effort to save the tree. Arborguard Tree Specialists in conjunction with Facilities Management grounds personnel developed a plan to prune, fertilize and alleviate soil compaction by utilizing a Terravent machine. The Terravent works by driving a probe deep into the soil and injecting a blast of compressed nitrogen gas under very high pressure, which fractures the sub-soil to allow water, oxygen and nutrients to enter deeper into the soil resulting in a more suitable soil profile for roots to flourish. The tree responded very well and vigorous new growth sprouted from the branches over the next several years. However, the tree has always had a double leader trunk and both of these upper leaders have extensive decay. Certified arborists inspected the tree this past May and in collaboration with several members of the Committee on the Environment agreed that the tree will only continue to decline over the coming years and the trunk would eventually fail, resulting in damage to property and potentially causing injury to pedestrians. Due to the high risk of potential failure in the coming years, it was decided that it would be best to remove the tree and plant a successor that will provide shade for the next century. The replacement tree will be planted as quickly as possible after the removal and will be installed prior to the beginning of the new semester.